Why did the chicken cross the road? I have it on the greatest authority that it was to escape the clutches of the egg farmer. B is for Betsy. 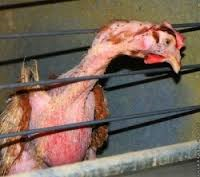 Betsy was a free range chicken who died a faster, cleaner death than did millions of her contemporaries. Eleven million a year, in fact. In the still of the night, a fox decapitated Betsy. Her former companion, Dorothy, wandered around aimlessly for a couple of weeks until a family member took pity on her and trotted off to the market and brought home a (barely) living replacement. This new bird had no name which was just as well, because (let’s call her Miss X) she didn’t last long. Miss X had been a caged bird. She had already given her all to the egg farmer before she was shipped off without so much as a pat on the back for services rendered. Miss X was brought home to be a companion to Dorothy but within days she was found dead, where she had been hiding behind a bush. Miss X was given a decent burial. No one had the heart to cook her. Even had we wanted to, there was the thought of all those hormones and antibiotics that Miss X had been riddled with. What I learned from meeting Miss X was that she was never going to establish a pecking order. She had spent her short life squeezed into a cage the size of a file drawer with 8 other chickens and she had been de-beaked. As Miss X’s life span was a short one it didn’t much matter to the farmer that debeaking impaired her ability to eat, drink and wipe her beak. And as there was no room for her to move or stretch her wings, it only made sense to have them clipped. Miss X lasted only a few days after being brought home, so I’ll never know what she would have said to Dr Jeff Downing, from the Faculty of Veterinary Science at the University of Sydney. Dr Downing’s research was funded by the Australian Egg Corporation. His research concluded that ‘there is no distinct difference between the stress levels encountered by caged, barn or free range chickens.’ Had Miss X lived I would have liked to have witnessed the debate between her and Dr Downing. But of course Miss X would have had to get past the language barrier and the problem of the non-existent beak. I explained to Dorothy, an enclosure had been built to keep her safe at night, that even if she stopped laying eggs, she had a job for life and room to roam. I was no vegetarian, I said, but I vowed to only buy free range eggs and chickens. I’m sure she understood. She gave me a heartfelt cluck before turning her attention to pecking at the ground in search of a tasty worm. Well said Mary. My view is: if you can’t afford free range products, you can’t afford the product. I can remember as a child only having chicken at Christmas and I am none the worst for it. We eat too much meat anyway. Trouble is, even though I occasionally play with the thought of being vegetarian, I like my meat. I don’t see why people need to make an animal’s life miserable, though. Mary, Most of us eat too much meat. We all should cut down but I too don’t intend to give it up. I just ensure any meat we eat is free range, or grass fed or whatever it takes for the animal to have had a decent life. I know too much meat isn’t good for us, but like everything else that I do, I tend to overdo it. I agree, it’s not so hard to choose free range. We can only be an influence for good if enough of us do it. You can find a (paid) expert to corroborate any position, no matter how much it goes against common sense or even established scientific fact. I do try to buy free-range and grass fed meats whenever I can. I think if more people became aware of how food gets to our dinner tables, real change would finally come to the food industry. John, I think a lot of people do know something at least abut how food gets to our dinner tables. Now and again there’s a fuss in this country about sheep and cattle being slaughtered inhumanely or dying during live export transports and then it token protest. I think that if everyone bit the bullet and bought free range eggs the price would go down and farmers would have to change their ways. It’s a good thing that sometime back, people decided to draw attention to how the chickens live, or should I say exist? I wonder at Dr Downings research results if it had been funded by an impartial source. I wondered about Dr Downing’s research too, Bruce. That’s why I have no time for experts.